BoRoVo is an application for Android smartphones, implementing a protocol that enables private, verifiable and robust decentralized boardroom voting and elections. The usability of the application was evaluated in user studies, resulting in usability score well above average. The BoRoVo application is available on request. A user manual for the application was developed and can be downloaded here. The development of the application and the application have been presented at several scientific venues, e.g. at the 6th International Conference on Electronic Voting (EVOTE) 2014 (see Figure 1). 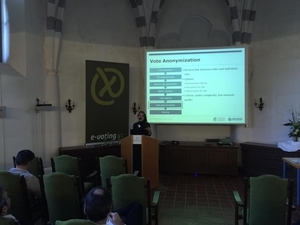 Figure 1: Oksana Kulyk presenting the development process of the BoRoVo application at the EVOTE 2014 conference. One of the possible practical applications of electronic voting protocols are the elections of smaller scale, such as among board of directors, in university committees, or in classrooms. Such elections are often conducted among small groups of voters, in ad hoc way, and with limited central infrastructure, thus posing a different set of challenges, than large-scale political elections. Currently, they are most often conducted via raising of hands or paper voting, which, however, excludes the voters, that are not physically present in the same room as others, from participating in the voting. Therefore, an application that enables secure remote electronic voting, would be practical in cases of some of the voters being able to participate also while travelling or not being able to attend the meeting in person for some other reason. A typical application setting of the BoRoVo application is shown in Figure 2. Figure 2: A typical application setting of the BoRoVo application: A group a four people needs to come to a sensitive decision. 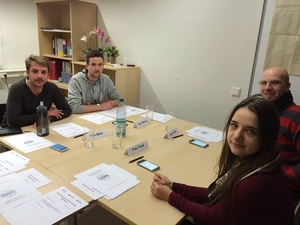 The project 'BoRoVo': Board Room Voting is funded by the German Federal Ministry of Education and Research (BMBF) under grant no. 01IS12054. The authors assume responsibility for the content. In: 10th International Conference on Availability, Reliability and Security (ARES 2015), August 2015. Electronic Voting with Fully Distributed Trust and Maximized Flexibility Regarding Ballot Design. Oksana Kulyk, Stephan Neumann, Christian Feier, Melanie Volkamer and Thorben Köster. In: 6thInternational Conference on Electronic Voting (EVOTE), IEEE, Oktober 2014. A Usable Android Application Implementing Distributed Cryptography For Election Authorities. Stephan Neumann, Oksana Kulyk, Melanie Volkamer. In: 9th International Workshop on Frontiers in Availability, Reliability and Security, p. 198-207, IEEE, August 2014. Towards a Practical Cryptographic Voting Scheme Based on Malleable Proofs. David Bernhard, Stephan Neumann and Melanie Volkamer. In: Steve Schneider, James Heather, Vanessa Teague: Lecture Notes in Computer Science, 4th International Conference on e-Voting and Identity (VoteID13), vol. 7985, p. 176 - 192, Springer, Juli 2013. Towards a Practical Mobile Application for Election Authorities. Stephan Neumann. Poster presentation at 4th International Conference on e-Voting and Identity (VoteID13). Decentralized Mobile Voting on Smartphones. Oksana Kulyk.